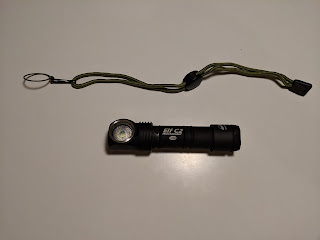 Reviews of flashlights, pens, chargers, and other gear and tech I'm interested in. 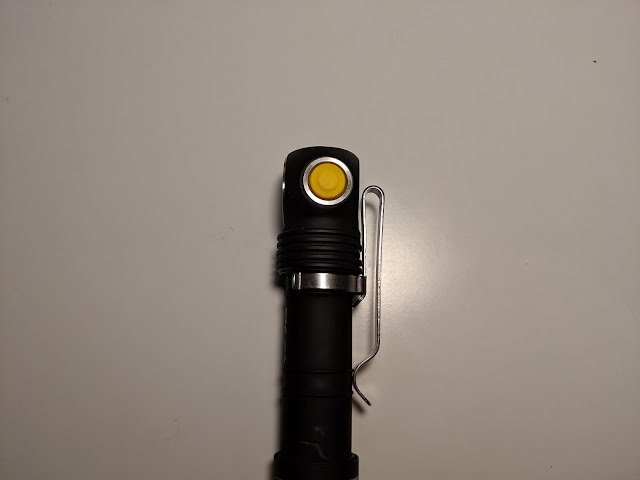 Today I have the Armytek Elf C2 with the warm emitter option for review. 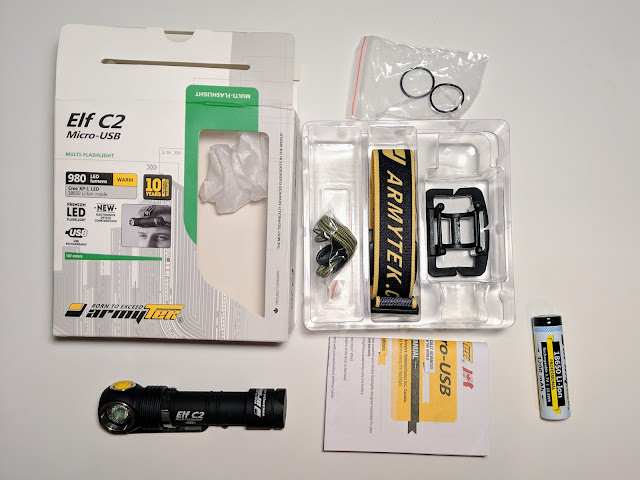 Armytek sent this over for review after reaching out to me on budgetlightforum.com. 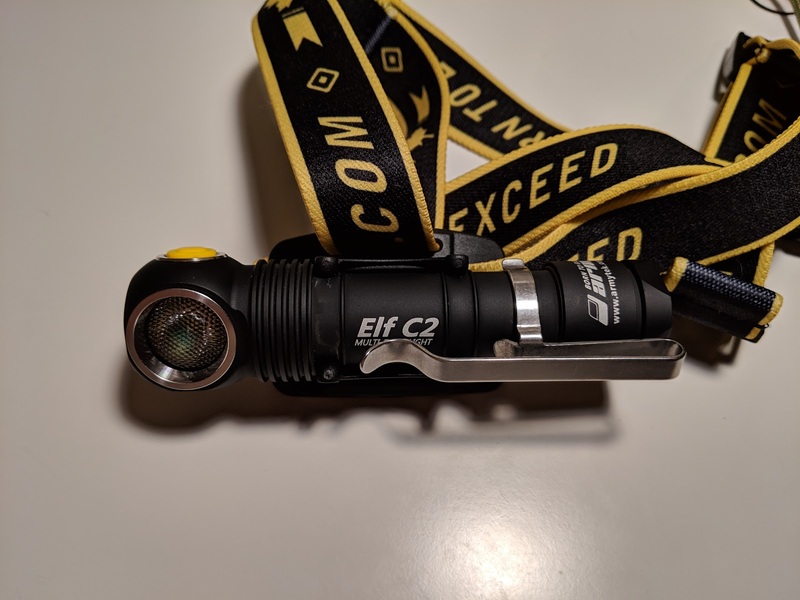 The Elf C2 is a right angled light, that can be used handheld or as a headlamp with the included band. It runs on a single 18650 that comes with it, charges via micro-USB, and sells for a very reasonable price. They were also nice enough to give me a coupon code - enter bmengineer at checkout to get 15% off of your purchase. This light is also available with a cooler CCT, and in a smaller version, the Elf C1. I expect that light to be functionally identical aside from the smaller cell size. I had a really hard time finding anything I didn't like about this light, and that's sort of my specialty. 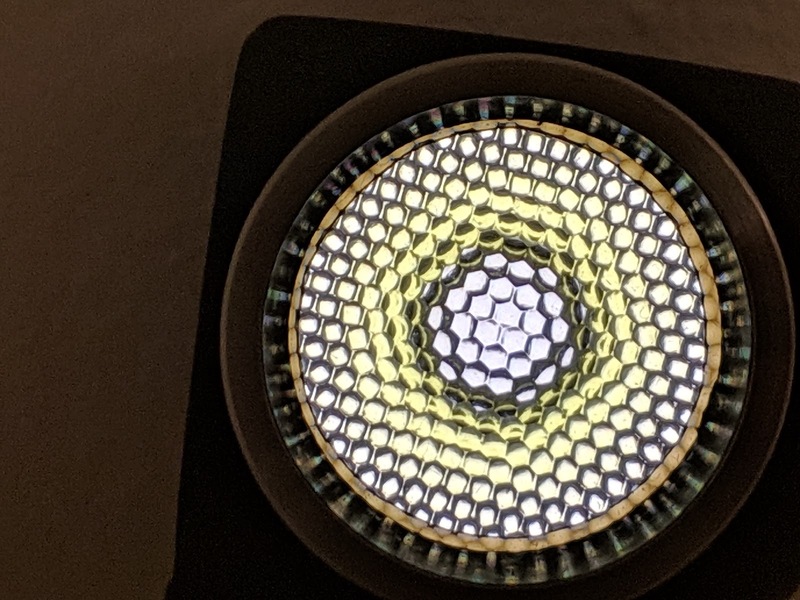 I guess it could be a few mm shorter by changing the tailcap design, and sure, I'd love to see a high CRI LED like a the Samsung LH351D used in place of the XP-L... but those are minor nit-picks. The UI is great, the build is great, the button feels great, even the head band is the best I've ever used. I also love the little details that make the light seem more robust, like the double o-rings and the deep stainless steel bezel. I've recommended this light countless times based just on the spec-sheet, and now that I've tried it out I can confidently continue to recommend it. The light measures 122.9 mm long, 28.0 mm around the widest part of the head, and 20.2 mm around the cell tube. The light weighs 67 g without a cell, 111 g with the included cell, and has a 'trail weight' of 165 g with both the cell and headband. 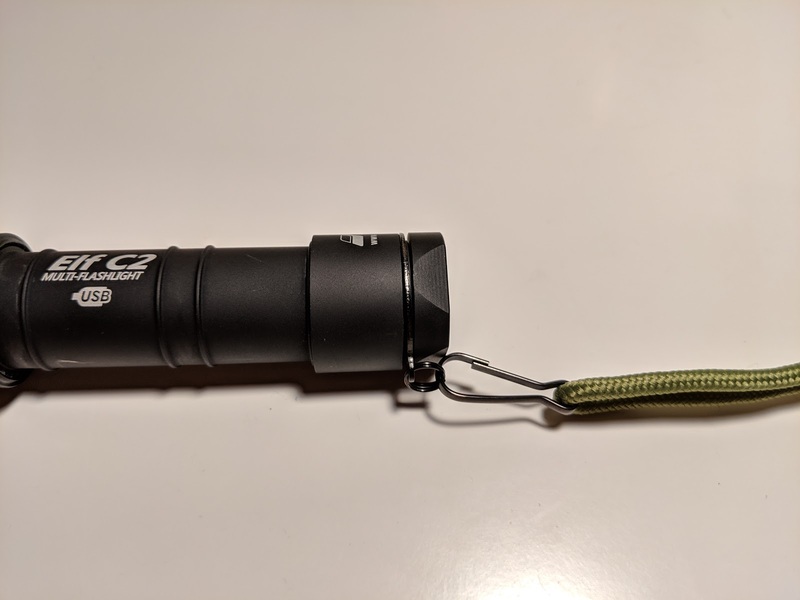 The light is noticeably smaller than the Convoy S2+ I like to use for size comparisons, but a bit larger than the Skilhunt H03 RC. This light has the same chalky anodizing as the Armytek Partner C4 Pro I have. Some people won't be a fan, but I am - it's grippy, and seems to stand up well to wear. It does tend to collect dust and look scratched, but those are actually just marks and rub right off. The only place I managed to scratch my light was where the clip attaches to the light, by twisting and removing it. It's an interesting finish for sure. 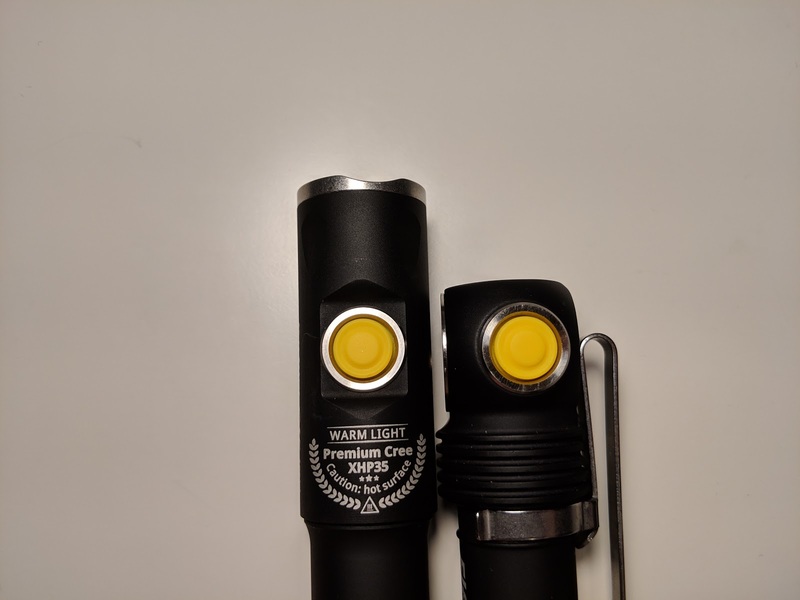 The head of the light is the first of 3 locations with labeling, something Armytek is also known for. This manufacturer sure is consistent across their product lines! 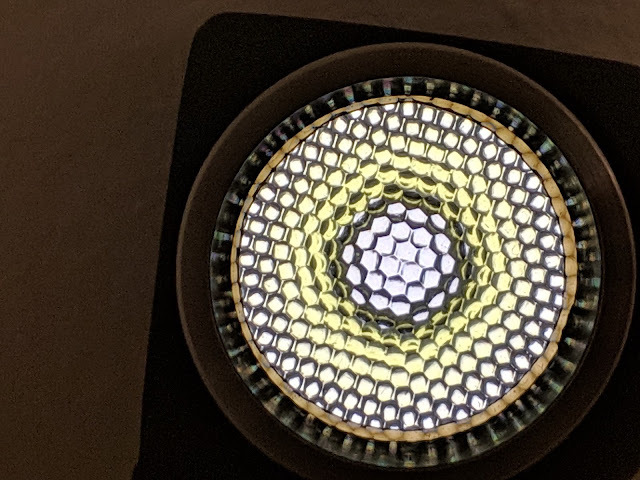 Here on the top of the light, it lists the color temperature (warm, in this case), the LED, a "hot" warning, and the same olive branch design I noted on my other light from them. The head is an interesting trapezoidal shape as well. At the front of the head, the LED sits behind a dimpled TIR lens, covered with glass, and set deep behind a stainless steel bezel. I like that it's set so far in to the body to keep it protected from scratches and breaking, and I always like to see scratch resistant stainless steel bezels. On the side of the head, the yellow switch is also held in place with a stainless steel ring. This protrudes slightly and is also identical to the one used in the Partner C4 Pro. On the back of the head, the micro-USB charging port is covered with the smallest dust cover I have seen to date. This actually inserts into the port, instead of sealing the perimeter around it. 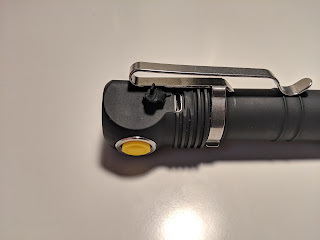 Armytek claims this cover is just to keep dirt and debris clear, and that the light is still water resistant if the port is open. There are 5 fins cut around the base of the head to help with cooling. The cell tube is thread locked to the head. It's a simple cylinder with two notches to keep it from sliding around within the headlamp bracket. One side has the model name and charging information etched into the finish. The tailcap is actually two pieces. The first part is a plain cylinder, with the brand and regulatory markings etched into it. The second smaller cap holds the removable magnet in place. The base is perfectly flat, so the light has no issues tail standing. 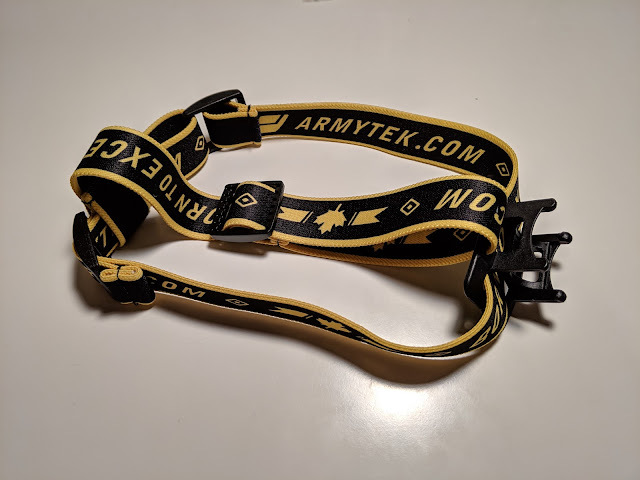 Inside the tailcap, Armytek uses double o-rings as a second defense against liquid ingress. The threads are square cut and anodized, so physical lockout is possible with a slight turn of the tailcap. There's a large spring serving as the negative cell contact. At the positive end of the cell tube, a small button serves as the positive contact. Right angle lights are especially versatile in the number of ways they can be used. Even though these aren't usually hand held, they certainly can be. It's a small light that fits in the hand well, and the switch is easy to reach with a thumb while holding the light (as long as you're right handed). 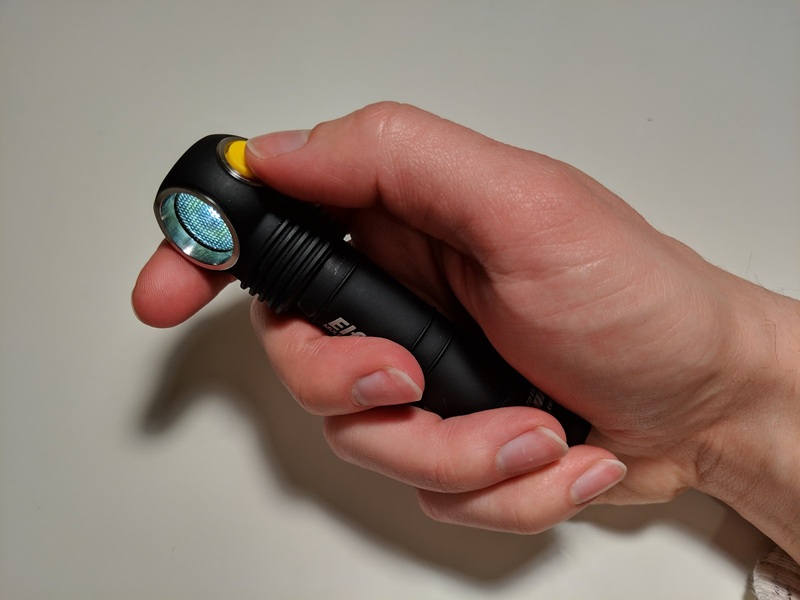 The unique shape of the head makes the button easy to locate as well, and the larger head and tail cap mean there's no risk of the light sliding from your hand. One of the major benefits to this light is the combination of the right angle form factor with the magnetic tail. The magnet is strong enough to hold the light in any orientation I tried it in, and the shape means it can easily be rotated to point in the desired direction. I always find this handy for working on any sort of appliance, or doing DIY repairs around the house. The magnet on this model is held in its own little pocket at the end of the tailcap. This design makes it easy to remove if you prefer not to have a magnet, but I feel it adds a bit more length to the light than necessary. If you're using the light for EDC, you can also use the included pocket clip. The clip carries fairly deep, and has an excellent ramp where it comes down to meet the cell tube. One of my big complaints with many clips is that they often have a bump here that catches on pockets and gets in the way. This great contact unfortunately means that spinning the clip around is enough to scratch the body of the light, but in all honesty I still prefer it. I'll take function over form any day of the week. The clip can be installed for either head up or down carry, and can even attach to the body outside the two clip grooves to be used at the same time as the headband. The headband for this light is a very novel design. Instead of the light having to be painfully forced through two silicone rings, it's a hard plastic clip that the light just snaps into or out of when you need it. This alone easily makes it my favorite headband of any that I have tried. That said, it's not without it's flaws. The headband comes disassembled, and the top band either had the plastic loop installed backwards or I just put it together wrong three times in a row - equal likelihood of both these possibilities, really, but either way it's annoying. The clip has a secure grip on the headlight when it's installed, and can easily be rotated up or down. There are no reflective details on the headband, and no grippy sections, so it may not work well with helmets. 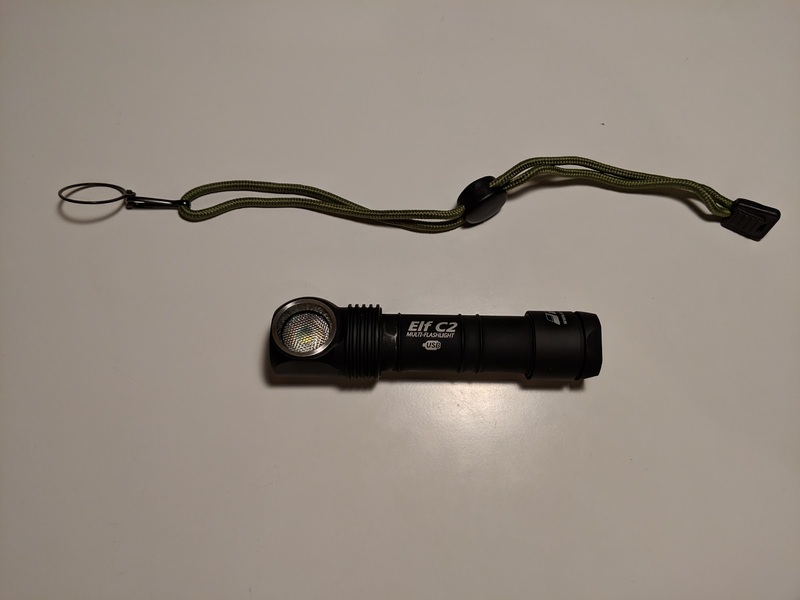 Finally, the light includes a lanyard as well. 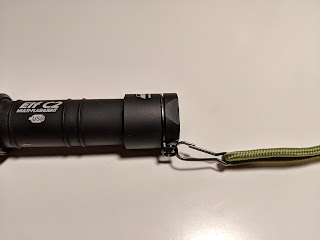 This lanyard attaches with a collar around the magnet housing, and I like that it won't slip off - but I do find there's a bit more hardware than necessary between the light and the cord. The interface used here is a relatively simple one used by many manufacturers, and it's easily one of my favorites. Press from off to turn on the last used "main" mode. Press from on to turn off. Hold from off to turn on in moonlight - keep holding to step through the modes, and release at the desired level. Hold when on to cycle through the main 3 modes. Double tap when on to get to turbo. Double tap again to return to the last mode. The indicating switch blinks when you turn the light on to indicate the charge level - either green, yellow, or red. This is a welcome feature, but it's bright enough that it can be a bit jarring if you're using one of the lower modes. The indicating LED will also flash yellow or red if the light is getting warm or hot. The light I ordered has the "warm" color temperature - Armytek also sells a "white" model that will be closer to the cooler side of neutral. I'm happy with the CCT, and I really like wide, floody beams like this for headlamps. It's not high CRI like some of the other headlamps on the market, but it's a good tint and I'm happy with it. This light is powered from a single 18650 cell. It comes with a flat top, unprotected 18650 that measures 18.3 mm by 65.1 mm, and is labeled 3200 mAh. 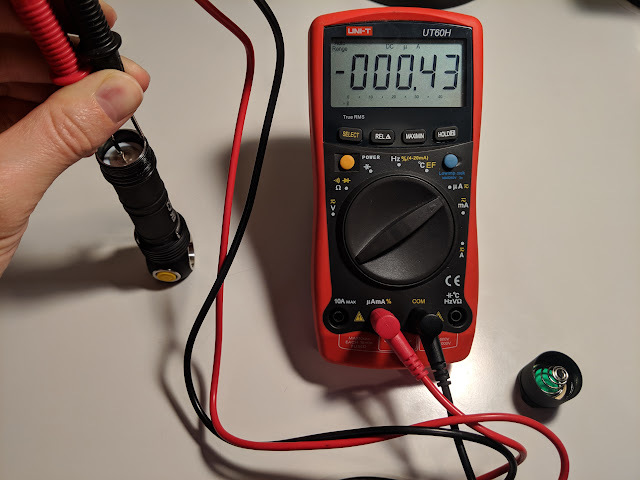 A protected Nitecore button-top cell measuring 69.7 mm long also worked without any issues, showing the light is not picky about cell length. On turbo, the light stepped down about 5 minutes into the test due to head, and settled at around 60% for the remainder of the test. It fell below 10% after 136 minutes, exceeding the 2 hours claimed. On medium, the light showed no stepdowns and held output stable for the 4 hours claimed by the manufacturer. In both cases, the light was still running very dimly when the test was stopped. Since I had to dunk the light for the waterproofing test anyways, I took the opportunity to do a second turbo test. This showed that the step down is indeed thermally regulated, as the second test had no step downs. Instead it just tracked the cell voltage downwards. 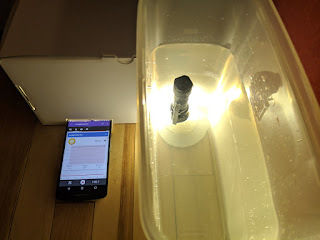 Even with this extreme cooling, the light took almost 2 hours to fall below 10% of the output at 30 seconds, which shows Armytek was extremely conservative with their stated runtimes. All runtimes were stopped when the light was still glowing dimly, with the cell being run as low as 2.79 V.
As the switch is electronic, there will be a bit of standby drain on the cell. I measured this at a negligible 0.43 μA. This is low enough that it will likely not affect the life of the cell at all, and the self-discharge will drain the cell faster. Charging the light is done just by plugging a micro-USB cable into the light. When charging, the indicating switch glows red, and changes to green when complete. The light can be used when charging with the same functionality and interface. Even if no cell is installed, the light will still work on USB power. Charging was measured from the USB port, bringing the internal cell from dead to full. The charge shows a good CC-CV curve, sitting at about 0.5 A at 5 V. This means the time to completely charge is a bit slow at almost 7 hours, but it's also a good safe rate. At the end of the test, cell voltage was measured at 4.19 V.
I've always hated products that use little plastic flaps to keep water out. I never find them to be reliable in the first place, and they're 100% ineffective after they eventually fall off. 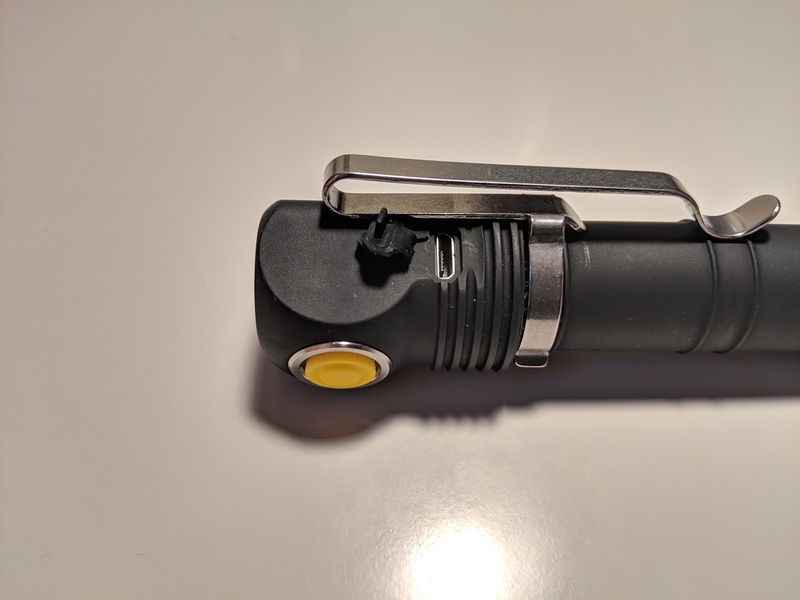 Although Armytek doesn't claim anywhere on their site or in the manual that the micro-USB port on the Elf C2 is internally waterproofed, they have said as much on Instagram in the past. I performed an unscientific test of this by propping the USB port open with the clip, submerging the light, and repeating the turbo runtime test. There was no sign of water ingress to the cell tube, as should be expected. After this test, all functions (including charging) worked as intended. 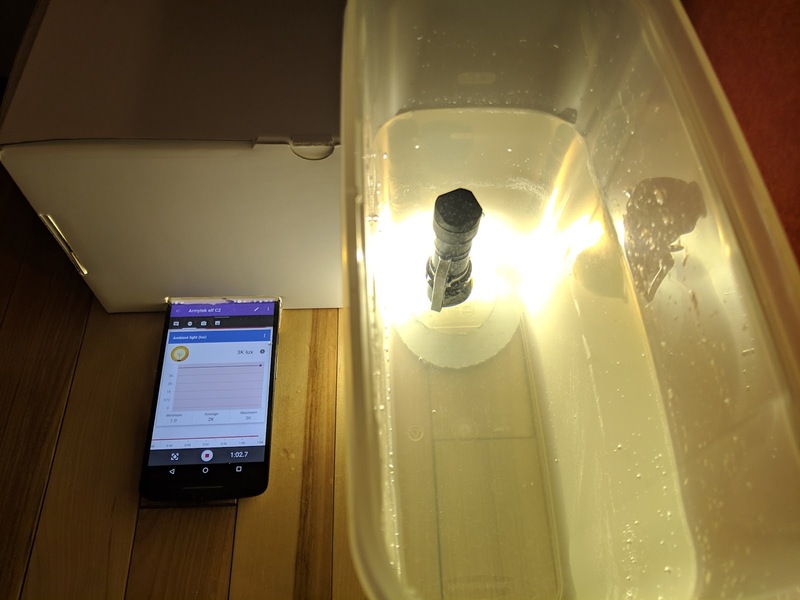 This test is far from exhaustive, but it's good enough for me to trust the light in a rainstorm or for a quick dip in the water on my next caving trip.